Major General Henry Knox Lodge owes its origin to a degree team which was organized from New England Chapter, National Sojourners, to confer the Master Mason's Degree on Major (now Colonel) Louis Hopewell Bauer in Eliot Lodge, Jamaica Plain, in May 1924. This team composed of officers of the Regular Army, National Guard and Organized Reserves, was immediately called upon to work the degree on military candidates in various Lodges throughout Massachusetts until at length the question was raised among its members: Why should we always work for someone else? Why should we not have a Lodge of our own like the English military Lodges and those which were attached to Washington's army during our War for Independence? Such a Lodge would not only cement by the ties of Masonry the friendships formed in the Military service, and would furnish hospitality to Brethren in the armed services who were temporarily in Boston, but would give an opportunity to members of the regular services to take an active part in the Lodge work, something which they could not do in the ordinary civilian Lodge. The project was presented to the Grand Master, Most Worshipful Dudley H. Ferrell, who expressed not only approval but a lively interest in the plan, and a formal petition for a dispensation was drawn up and presented to the various Boston Lodges. Although the idea of the Lodge originated with Army officers, it was at once decided that the Lodge should cover all the armed services and following the precedent of all known military Lodges, should include enlisted men as well as officers. So well has this objective been adhered to that the Lodge has had on its rolls members of every rank in the Army from private to major general and in the Navy, except for the recently revived grade of commodore, has had every grade (though not every rating) from seaman to rear admiral. It has had members of both the Marine Corps and the Coast Guard, although from the smaller membership of these two services the number of members from them has been less. 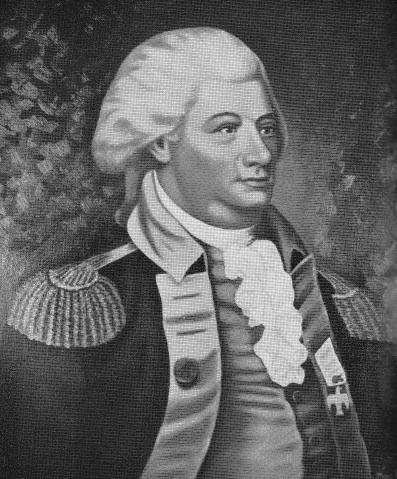 The name of Major General Henry Knox was selected for the Lodge for two reasons: first. General Knox was a Bostonian by birth and was intimately connected with the history of Boston and Massachusetts, and second, it was a name connected with both the Army and Navy, because when General Henry Knox was Secretary of War, the War Department included both the Army and Navy. When the Lodge was instituted, the Masonic record of General Knox was unknown. He was believed to have been a member of The Massachusetts Lodge, which was organized in Boston in 1770, shortly before Henry Knox became of age. Researches, however, by Prof. Gilbert Patten Brown of New Jersey convinced him that General Knox was made a Mason along with Major General Nathaniel Greene, in St. John's Regimental Lodge in the winter of 1776-77 at Morristown, New Jersey, where Washington's army went into winter quarters following the victories of Trenton and Princeton. Major General Philip Schuyler of New York presided and Washington himself was present. These facts were communicated to our Lodge in a letter of Brig. Gen. William E. Horton which was read at our meeting on September 25, 1929 and are entered in the records of that date. The Lodges and the several District Deputy Grand Masters received the petition for the dispensation in a most friendly manner, and the necessary consents were soon obtained. In view of the name of the Lodge it was most appropriate that the first consent obtained was that of the Lodge of Saint Andrew, whose early members took such an active part in the events leading up to the Revolution, and that the consent which completed the necessary number was given on March 4, 1926, exactly one hundred and fifty years from that night when General Knox, then serving as a volunteer with Washington's army, mounted on Dorchester Heights the cannon which he had brought from Fort Ticonderoga, and which were to force the British troops to evacuate Boston thirteen days later. It was never the purpose of the Lodge to intrude into the field of the civilian Lodges, and consequently when the dispensation was requested it was expressly stated that the Lodge was for military and naval men only and that it would never accept an application for the degrees from any person who was not at the time in the active, retired or reserve military or naval forces. This promise has been strictly adhered to, both in letter and in spirit. When the question arose whether, on account of the official status of the United States .Maritime Service in World War II, its members should not be treated as in a status analogous to the Navy, the Lodge asked the Boston Lodges whether they were willing to have our field of work enlarged so as to include these men. Although the replies were favorable, the Lodge, on account of the ending of the war, decided to take no action in the matter. Another case was where a member presented the application of a man who had been in the service but had been discharged before his application was presented. As the application had been read before this fact was discovered, the Lodge on its own initiative presented the facts to the Grand Master, who realizing the peculiar status of this Lodge, authorized the return of the application for want of jurisdiction. Another instance of the scrupulousness with which the Lodge has adhered to its promise is its action on persons who were soldiers in name only. In the years preceding vVorld War II, when Congress made no provision for active duty training of the Enlisted Reserve Corps, it was brought to the attention of the Lodge that persons had joined the Enlisted Reserve Corps for the sole purpose of applying to this Lodge, our fee for the degrees being less than that of most Boston Lodges. In view of the fact that such persons received no training and performed no duty whatever and were not even issued a uniform or equipment, the Lodge voted that until such time as Congress provided for active duty training, persons whose sole military connection was enrollment in Enlisted Reserve Corps were not acceptable as members. On December 28, 1949 similar action was taken after World War II in reference to persons in the Inactive Reserve who had shown no real interest in the military service. For affiliation the Lodge accepts men who have been in the armed services. The only deviation from this rule was in the case of the members of the Continental Color Guard of the Sons of the American Revolution. This organization, composed of lineal descendants of Revolutionary soldiers, wears the uniform of General Knox's four regiments of continental artillery and as a token of respect to him those members of the Guafd who were already Master Masons were invited to become charter members of the Lodge. The Lodge has had on its rolls members who served in the War with Spain, the Philippine Insurrection, the Mexican border mobilization and both World Wars, and one of the charter members, who died prior to the formal constitution of the Lodge, was Most Worshipful John Albert Blake, Past Grand Master of Masons in Massachusetts, who served in the United States Navy on the New Ironsides during the Civil War. Agreeably to the custom prevailing in all military Lodges, so far as known, the By-Laws of Major General Henry Knox provide that each member is expected to wear the uniform of his rank or organization at all meetings of the Lodge. The uniform is the badge of fraternity among military and naval men, and avoids any embarrassment to any member, no matter what his financial or social status. From the nature of the case, every member possesses a uniform, for even ex-members of the Army and Navy in the vast majority of cases belong to some uniformed veteran organization, whereas some members may not own formal evening or afternoon dress. On one occasion, a junior officer asked the Master to direct the officers of the Lodge to wear the special evening uniform at meetings. The Master after considering the matter, refused, on the ground that it was un-Masonic because as the enlisted personnel had no analogous uniform, it would introduce a cleavage between the commissioned and enlisted personnel, thereby violating that spirit of equality which is fundamental in Masonry, and particularly so in a military Lodge where general and private meet on the same level of fraternity, a principle which has always been characteristic of Major General Henry Knox Lodge from the beginning. As soon as it was evident that the required assents would shortly be forthcoming, plans were made for the ceremony of institution to take place on the United States Frigate Constitution whose construction was authorized by Congress and its keel laid while General Knox was Secretary of War, and to have the ceremony take place on the 150th anniversary of the evacuation of Boston by the British troops, an event which General Knox did so much to bring about; as stated above. 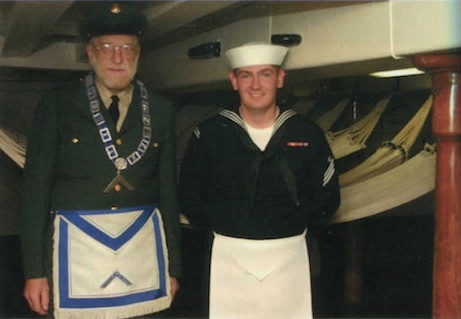 The institution took place at dusk March 17, 1926, on the gun deck of the historic ship at the Charlestown Navy Yard, and so far as is known, is the only instance of a Masonic Lodge ever being instituted on a war ship. The ceremony was conducted by Most Worshipful Frederick W. Hamilton, Grand Secretary of the Grand Lodge of Massachusetts, in the presence of 231 members and visitors, including the Master and Wardens of the various Boston Lodges and representatives of 15 other States and the Philippine Islands. The Bible on the altar was the family Bible of John William Shute, a soldier in the War of 1812 in which the Constitution won such fame and the gavel used was made from a knee of the Constitution and a timber of Faneuil Hall. The remaining regalia were loaned for the occasion by The Massachusetts Lodge, which later presented the officers' aprons to Major General Henry Knox Lodge. Following the formal exercises, the Brethren marched in Masonic procession to the Armory in the Navy Yard, which had been appropriately decorated for the occasion, where supper was served and addresses made by Most Worshipful Brother Hamilton, Right Worshipful Guy H. Holliday, Secretary of Harvard Law School and Past Master of The Harvard Lodge, the latter being the first University Lodge to be organized in Massachusetts, Major General Mark Leslie Hersey, U.S. Army, and Worshipful Benjamin Newhall Johnson, second Vice President of the Massachusetts Society, Sons of the American Revolution, the first and third vice presidents of that society being charter members of the Lodge. One of the first tasks confronting the Lodge was to find a meeting place suitable for Masonic use and in keeping with the military character of the Lodge. In the meantime, business meetings and rehearsals of the rituals were held in the court martial room at the Army Rase and in the apartments of Eliot Lodge, which were kindly loaned for use. The then Mayor of Boston was willing to give the Lodge a casemate in Fort Independence, the oldest continuously fortified spot in the United States, but difficulties of access and of heating and lighting made this place unsuitable. The Shirley-Eustis House in Roxbury, where General Lafayette was entertained, was also offered, but in addition to inconvenience of access, the fact that $10,000. would have been required to put the historic mansion in condition for use and the further fact that to prepare a suitable lodge room in the mansion would have marred the historic character of its appointments made it unwise to accept the offer. Finally the Lodge accepted the offer of the First Corps of Cadets and the Military Historical Society of Massachusetts to use the latter organization's rooms in the Cadet Armory. Although in some ways not adapted for Masonic use, this was a fitting home for a military and naval Lodge, and during our occupancy of it the Master's chair was the one used by our distinguished Brother, Admiral Farragut, in his cabin on the Hartford. The first meeting held in the Armory was on October 27, 1926 and the last was on April 25, 1928, at which time by request of the then Grand Master, it was moved to the Masonic Temple on Boylston Street, where it first met on May 23, 1928 and which has been its home ever since. In the first few months, applications for the degrees were slow in coming, but the Lodge did not in the least lower its standards for admission as is shown by the fact that a substantial proportion of those who applied were not accepted. On the occasion of the sesquicentennial of the Independence of the United States, the Mayor and Town Clerk of Weymouth, England, both members of English Lodges, were official guests of the Town of Weymouth, Massachusetts. The occasion seemed a fitting one for Major General Henry Knox Lodge to put on its first working of a degree ill the presence of these distinguished brethren from the mother country. A special meeting was held in the Armory at the Charlestown Navy Yard on July 8, 1926 in their honor. Brother Charles Garfield Keene, President of the Boston City Council and acting Mayor of the city, was present and officially welcomed the English guests. The Lodge then initiated as an Entered Apprentice, Leslie Francis Hart, a sergeant in the Regular Army who was the first candid^e to be initiated in Major General Henry Knox Lodge. At the same meeting, Fraternity Lodge of Newton worked the Second Degree upon three of their candidates. The English brethren had already seen the Master Mason Degree worked by our Lodges in Weymouth, so with this meeting they witnessed all three of the degrees as worked in Massachusetts. The two visiting brethren addressed the Lodge, and His Worship the Mayor presented an interesting set of pictures of the historic objects owned by All Souls' Lodge of Weymouth, England. The first candidate to be raised to the degree of Master Mason in the Lodge was Brother Albert Oilman Merrill, then a lieutenant, United States Navy, who received that degree November 24, 1926. An interesting feature of that meeting was that each of the two candidates, Brothers Merrill and Hart, was presented a Masonic Bible by comrades in their own branch of the service. The Holy Bible, Square and Compasses, presented by Max Harold Summerfield. under the auspices of the Society* of the War of 1812 and the Judge Advocates' Association, First Corps Area. At this meeting, Lord Thankerton, one of the British Lords of Appeal in Ordinary, was the Guest of Honor, an appropriate recognition of the fact that it was a British Expeditionary Force which liberated Palestine in 1917. The Lodge also has a gavel and block made from wood of the Frigate Constitution, presented by James Payne. Wardens' Truncheons made from a pew of the old Second Church, Boston, the Church of .Mathers, of which Rev. Edward E. Horton, D. D., Grand Chaplain of the Grand Lodge and a veteran of the Civil War was minister for many years. The Marshal's Baton made from a timber of Fort Independence, presented by William E. Horton. United States Flag, presented by Charles Trott Harding. Lodge Flag, presented by Edwin John Arnold. These flags are "standards" not "colors" for two reasons; first in honor of General Knox, a field artillery man, it was felt that the cavalry and field artillery size Hag was more appropriate; second, as the flags are chiefly used indoors, the smaller size flag was felt to be more convenient. Deacons' and Stewards' Rods, presented by Overseas Lodge No. 40 of Providence, R.l. At our request, these rods do not bear the emblems of office, but are plain and jointed in the middle, a great convenience, when they have to be transported for a funeral or church service, and a necessity if the Lodge should ever go into the field. These rods were presented not merely as a fraternal courtesy, but in recognition of our conducting the funeral service of Edward Gainer Hunt, a member of that Lodge. As a return compliment, we presented to Overseas Lodge a baton made from a timber of Fort Independence, similar to our batons. Rough Ashlar, a stone from Lexington Battlefield, presented by Edward Loring Child. Perfect Ashlar, a stone from Antietam Creek near the Burnside Bridge, presented by Frederic Gilbert Bauer. Trestle Board, presented by G. J. Uskitis. Working Tools of the second and third degrees presented by Frederic Gilbert Bauer. These are in imitation of hand wrought silver given by Colonel Joshua Wingate of New Hampshire, who commanded regiments in the Revolution, to his daughter. Point within a Circle, presented by William Walter Wade. Chain Collars for the .Master and Wardens, presented by Willard Hates Hamlin. These collars combine the emblems of Masonry with those of the Army and Navy. The other collars are of the simpler type used at the time of the American Revolution. The Hour Glass used by the Lodge is an old Navy Log Glass. As the original meeting place of the Lodge did not have an organ or piano, Brother William Purcell, later Master of the Lodge, for many years played trumpet calls at appropriate places in the work, and sounded taps at funerals and when the death of a member was announced to the Lodge. From the beginning, the Lodge foresaw the conditions which would arise when officers of the Lodge who were members of the regular services were ordered away, and when in time of war a large part of our members might be gone, and passed votes to meet those situations in advance. Our first Senior Warden, Colonel (later Brigadier General), George Davis Moore, reached the Senior Warden's chair in Hancock Lodge at Fort Leavenworth, but was ordered away before he could occupy the Fast, an honor which he later obtained in our Lodge. The recorded votes of the Lodge not only provide for this situation but also for the situation where, in time of war or other emergency, Lodge officers are called away on active duty. In World War II, when many were away, the Lodge preserved their places in line, and on their return they were given the office next above that held at the time of leaving. A similar situation has arisen in the present Korean situation and has been provided for in a similar manner. From its beginning, the Lodge has been conservatively financed. Its fee for the degrees was originally set at $55.00, the minimum permitted in Boston, and its dues were set at $4.00 in order that no one in the military or naval service might be kept out by financial reasons. In 1931, a questionnaire was sent to every one who had taken his degrees in the Lodge, asking whether he would have felt unable to afford membership in the Lodge if the degree fee or the dues had been higher. The replies to this questionnaire showed that both the dues and the degree fee could be raised without hardship to the members, and accordingly, in June 1931, the fee for the degrees was raised to $70.00 and the dues to $8.00, at which figures they still remain. On account of the peculiar character of this Lodge, a substantial percentage of its members will always be located at distant places, where they can receive but few direct benefits from membership. Accordingly, in December 1946, a class of non-resident members was established, comprising those who have no place of residence, business, study, or duty station within the counties of Essex, Middlesex, Norfolk, Suffolk, Plymouth, or Bristol. These members pay only $4.00 a year dues. In most Massachusetts Lodges, a member who has paid dues for thirty years is automatically exempt from further dues, but a member who wishes to purchase life membership pays the same fee therefor after twenty-nine years membership as he would pay when he joined the Lodge, with the result that life members are largely limited to those who were financially able to pay the fee therefor at or soon after the time they joined the Lodge. Major General Henry Knox Lodge from its organization has remedied this situation by fixing a graduated payment for life membership, the amount thereof depending on the number of years a member has paid dues, thus giving a fair opportunity to those who did not feel able to purchase life membership on joining but who later became able to do so. In spite of the confidence felt by the Lodge in those who handle its money, the Lodge provided for bonding the Secretary and Treasurer several years before the Grand Lodge imposed this requirement on all Lodges. The keystone of the financial structure of the Lodge is the provision in its By-Laws which, from its inception, has required all but $20. of the degree fee to be placed in the Permanent Fund. This sound financial policy has been urged by several Grand Masters, including Most Worshipful William Sewall Gardner, Justice of the Supreme Judicial Court of Massachusetts, Most Worshipful Samuel C. Lawrence, who commanded the 5th Massachusetts Regiment at the first Battle of Bull Run where he received a disabling wound, and Most Worshipful Leon M. Abbott. a prominent Boston lawyer and at the time of his death, head of the Scottish Rite of the Northern Jurisdiction. Efforts have been made to have the Lodge depart from this sound policy but have always been defeated, and it is to be hoped always will be defeated. On the last attempt, the committee made an exhaustive report which appears in the record for March 23, 1949 and which is worthy to be read by all members of this or any Lodge. As Gen. Lawrence said in 1883, "Nothing can be worse that the reliance placed by some Lodges upon the uncertain income which accrues from fees for degrees. It is dangerous to discount the future . . . Besides all this, the practice fosters an undue desire to increase membership with the consequent danger of carelessness as to the quality of the new Masonic material. I have myself seen the shipwreck of Lodges which have relied upon this means of support." The sound financial policy of our Lodge was fully vindicated during the depression, when, in spite of fewer candidates and consequent decreased income from this source, the Lodge functioned regularly and efficiently upon the normal income, i.e., the dues of members. At the same meeting an amendment was offered and passed a month later to liberalize the rules governing investment of the Permanent Fund so that the Lodge can use practically the same forms of investment which are legal for Massachusettss trustees, with added safeguards which the Lodge By-Laws impose. On three occasions the Lodge has united with the Society of the War of 1812 in events of interest to both organizations. On October 26, 1927, at a social gathering in the Cadet Armory, following a regular Lodge meeting. Rear Admiral Philip Andrews, U.S. Navy, addressed the assembled gathering on his experiences in European waters at the close of World War I. On Sunday, October 26, 1948, just twenty-one years later, the Lodge held a service on the Frigate Constitution in connection with the 150th anniversary of the launching of that famous vessel on whose deck the Lodge was instituted. In July 1936, it loaned its gavel for the meeting at Fort Independence mentioned above. The first funeral conducted by the Lodge was on June 5, 1926, when it conducted the services for Walter Gaines Hunt, a member of Overseas Lodge No. 40 of Providence, R.I. but a resident of Somerville, Massachusetts, the officers of Overseas Lodge assisting in the services. The first funeral of a member of our own Lodge was that of Stanwood Dricko, which took place January 1, 1927. Because of the military character of this Lodge, it has several times been called upon by the Grand Lodge to conduct funerals of brethren of distant Lodges who were or had been in the Army or Navy, and whose burial took place here. The first instance of this was on June 7, 1927, when we were called on to conduct services for Albion Parsons Pease, a member of Temple Lodge of Kansas City, Kansas, and a Past Commander of Edward W. Kinsley Post 113, Grand Army of the Republic, of Boston, who served in the 5th Massachusetts Infantry in the nine months service in 1862-3, the same regiment in which the grandfathers of three of the Lodge members served. The Lodge has had as its guests heads and officers of the various veteran organizations, Grand Masters of our own Grand Lodge, and officers of foreign jurisdiction, and on March 25, 1936, was visited by Brother Leverett Saltonstall, then Speaker of the Massachusetts House of Representatives, and subsequently Governor of the Commonwealth and United States Senator. 1 he records, which were not as perfectly kept in earlier days as under our present Secretary, indicate that up to January 15, 1951, the Lodge had held 247 regular and 131 special communications, a total of 378. Of these over 100 were for work, particularly during World War II. Because of the conservative financing above set forth, the Lodge now has in its Permanent Fund $9,449.15 on deposit in the savings bank and United States Defense Bonds of a maturity value of $15,500. With the present growth of the Lodge, by the time the bonds mature, the Lodge will have a Permanent Fund of sufficient size to guarantee its continued functioning in times of general financial adversity, and the income therefrom will be of substantial service in the trying years which we all believe face our country. On Sunday, December 7, 1941, came the crisis which was to determine whether Major General Henry Knox Lodge could justify its existence as an armed services Lodge. As our members were in virtually every branch of the military and naval establishments and scattered wherever the United States Flag flew, it was out of the question for the Lodge to take the field with any one command, in imitation of the English Military Lodges whose members are all in a single organization. Our Mission was plainly to hold aloft the torch of Masonry in Boston, to provide a Masonic home and welcome for brethren of the armed forces stationed or passing near Boston, and to make Masons of worthy members of the services who desired to take on Masonic duties. How well this duty was performed, let the facts tell. Although nine-tenths of our members and many of our officers were called to active duty in Europe, Africa, the Pacific, and parts of the United States, the Lodge continued to function. Members residing near Boston who were not called to active duty and members whose duty stations were here kept the light burning. Members of other Lodges, some of whom since have been rewarded by honorary membership in this Lodge, came forward to help. The Grand Lodge was always ready with dispensations to meet our needs. Special meetings for work were a regular occurrence, the climax being reached in August 1945, when the Lodge held six meetings. Even under these circumstances, it was not always possible to hold a meeting in season to confer degrees on persons about to leave and not only the other Boston Lodges allowed us to use their meetings for our candidates, but Lodges in other states cheerfully met our requests to confer degrees on persons stationed near them. Our Grand Lodge furnished funds to entertain visiting brethren at dinner. It may truthfully be said that there was no call of duty during these trying years which the Lodge did not meet. We surmounted every difficulty as it arose, as General Knox did when he brought the cannon over the snow from Fort Ticonderoga to Boston even recovering one gun which fell into the Hudson River. We may well look back with pride on our work. One of the members of other Lodges who came forward to help in this time of stress, though not himself a military man, was Worshipful Roger A. Vint, Past Master of Samuel Crocker Lawrence Lodge, of Medford, who is now serving his sixth term as Secretary of Major General Henry Knox Lodge. He has rendered service of inestimable value to the Lodge, and the condition of our present records and our Lodge affairs is due in large measure to the efficiency which he has displayed in that office. His services amply earned the honorary membership which was bestowed upon him. The only formal Ladies' Night held by the Lodge was on March 7, 1932 at the Hotel Kenmore. We have, however, held several public installations of officers to which the ladies were invited, a social hour with refreshments following the meeting. With the scattered character of our membership, the ladies of our families do not know each other in most cases, and a public installation has proved more successful to bring them together socially than has a formal Ladies' Night. The outstanding event of this nature was held October 26, 1936 in the Armory of the Ancient and Honorable Artillery Company, when Brother Melvin Bertram Summerfield was installed as Master. The following brethren have served as Master of the Lodge, their term of office being from September preceding to September of the year named, except in the case of the first Master, who served from March 1926 to March 1927 under the dispensation and from March to September 1927 under the Charter. The branch of the service of each is given after his name, and those deceased are marked by a dagger (†). Frederick Gilbert Bauer, Army, 1926-27, Past Master of Eliot and Wessagusset Lodges. Six of our brethren have attained the title of Right Worshipful, Sydney Kenneth Skolfield and Chauncey Dean Merrill by being District Deputy Grand Master of the Chelsea Third Masonic District; William Walter Wade by being District Deputy Grand Master of the Arlington Sixth District; Rev. Frank Byron Crandall by being District Deputy Grand Master for the 13th Fitchburg District; Charles Henry Sargent, Jr., by being Grand Representative of the Grand Lodge of Massachusetts near the Grand Lodge of the Valle of Mexico, and Roger A. Vint by being Grand Representative of the Grand Lodge of Manitoba. Right Worshipful Brother Sargent is the Relief Commissioner of the Grand Lodge now. Several of our members have been or now are the heads of Scottish and York Rite Bodies. The term of office of Right Worshipful Chauncey Dean Merrill is worthy of particular note. He returned from overseas service in the fall of 1945 and was put back into line in the office of Junior Warden, to which position he would have succeeded had he not gone overseas. In the following December, the Master of the Lodge, Right Worshipful William Walter Wade, was stricken with a serious illness which prevented his attending the Lodge again that year. On April 21, 1946 the Senior Warden, Brother Lincoln Lothrop, died suddenly leaving Brother Merrill to carry on alone the work of the Lodge. As illness or absence on his part would have prevented the Lodge from meeting, a special election was held to fill the office of Senior Warden, and he was promoted to that office and the Senior Deacon moved up to Junior Warden. The efficiency with which he conducted the affairs of the Lodge, after he had been absent for some years, amply deserved the honor which the Grand Lodge conferred upon him by making him District Deputy Grand Master. Escutcheon. Quarterly, azure and gules, a book opened proper charged with a Masonic Square and Compasses or in the first quarter, a dexter arm couped embowed clothed and ruffled saltierwise between two mullets in fess of the last in the third quarter, a sinister foul anchor of the third in the fourth quarter all within bordure or. Crest. On a wreath of the colors a frigate in full sail proper. Symbolism. The figure in the nrst quarter represents the Holy Bible, Square and Compasses, indicative of the essential character of this Lodge. The figure in the second quarter is the crest of the State of Massachusetts and thus signifies the Masonic jurisdiction to which this Lodge belongs. The third and fourth figures are symbolic, respectively, of the Army and Navy; but the two stars embracing the cannon add an extra significance, in that they constitute the insignia of a major general, the rank of Henry Knox, for whom this Lodge is named, a distinguished Massachusetts officer, and a Mason, in General Washington's army, who was primarily an artilleryman and subsequently was Secretary of War and Navy in President Washington's cabinet. The crest represents the U.S. Frigate "Constitution" which famous vessel's keel was laid under General Knox's administration and on whose gundeck this Lodge fittingly held its first communication. The motto, Deo et Patriae, For God and Country, is eminently proper for a Lodge whose members not only revere the Supreme Architect of the Universe but have all taken an oath "to support and defend the Constitution of the United States against all enemies foreign and domestic". The Lodge has not always sailed over calm seas. Differences of opinion have arisen which at one time seemed to threaten the existence of the Lodge. Masonic feelings and common sense, however, have solved these difficulties and restored that harmony which is the strength and support of all institutions, more especially this of ours. In our Lodge, the members have the added tie of comradeship in the service of their country, that same country which General Knox helped to establish. We are now facing a period of uncertainty and trial, the end of which none can foresee. Some of our membership have already been called away on active duty, and, if we face another major war, the sacrifices and efforts we shall have to make may exceed those of the last war. We must meet this challenge as we did the last one, and by girding ourselves for the task before us and carefully administering our finances, we will come out of it with flying colors and strength renewed. As we look forward to our second quarter-century, may we do so with the vision of Right Worshipful Benjamin Franklin, who, at the adjournment of the Constitutional Convention of 1787, looked upon the sun painted back of the President's chair and prophesied that it was a rising and not a setting sun, and may we not forget the command given to a famous Pennsylvania company in the Civil War: "And the Captain said: 'Till the last man's dead, March on and on and on!' " So may we be true to our motto and add new lustre to the name of the famous soldier and patriot whose name we bear: Major General Henry Knox. Major General Henry Knox Lodge, Massachusetts' only military Lodge, observes its 50th anniversary with a sense of pride and satisfaction in the knowledge that it has earnestly endeavored not only to keep alive, but to advance, the aims and ideals of our predecessors. We have always been bound together by a double tie — the strong bonds of Masonry and of the Military. Our duty is service to both. We are also proud that our Lodge's semicentennial coincides with the Bicentennial of the United States of America! The Lodge was instituted on the Gun Deck of the historic USS Constitution, affectionately known as "Old Ironsides", at the Boston Naval Shipyard in Charlestown on 17 March 1926, the 150th anniversary of the evacuation of Boston by the British. In 1776 this was the first major American victory of the American Revolution, made possible by the feat of our namesake, Henry Knox, in literally dragging the captured British cannon under hazardous wintry conditions, over unmarked trails, from Fort Ticonderoga, New York to Cambridge, Massachusetts. It is perhaps the only Masonic Lodge ever formed on board an active, commissioned war vessel, a fact that has been noted by a number of Masonic scholars and publications. In 1951, our Charter Master, Col. Frederic Gilbert Bauer, Boston born graduate of Harvard, distinguished lawyer, soldier and patriot, and Worshipful Master of three Lodges, composed our 25-year history which is set forth in the preceding pages. It is completely factual, fully detailed, and written as only the brilliant founder of this Lodge could. This paper is an effort to continue our Lodge's history through the next quarter-century, from 1951 to 1976, so that together they constitute the 50-year history of Major General Henry Knox Lodge. Naturally, the first half, explaining why and how it came into being, its origins and its early days, its growth and development, constitute a moving and fascinating story, while the second half is of necessity less dramatic and more routine. We have held ten regular communications per year, one on the fourth Wednesday of each month from September to June, inclusive, so that our March 24, 1976 Communication, the Official 50th Anniversary Meeting, is numbered our 500th. Our total of special meetings is 184. We have met regularly at Masonic Temple, 186 Tremont Street, Boston, Massachusetts usually in Tuscan Hall on the fourth floor. World War II, which ended in 1945, saw the greatest number of men under arms in our Nation's history, and left us with large and active reserve forces. This was soon followed in the early 1950's by the so-called United Nations police action in Korea, which also meant considerable American military activity. Naturally, military candidates and affiliates appeared in goodly numbers, and our Lodge was kept busy with meetings and functions of various kinds, encompassing degree work, programs, speakers, dinners, serving as host to visiting military personnel, etc. Our Grand Lodge encouraged our activity as the recognized servicemen's Lodge in the Jurisdiction. As befits a military Lodge, officers and candidates for degrees always wore their service uniforms, while all others were encouraged to do so. The traditional Hag ceremony, consisting of posting the national colors and the distinctive Major General Henry Knox Lodge Hag, with the recital of the Pledge of Allegiance or the singing of a stanza of the Star Spangled Manner, was observed at all our gatherings. In this connection, we recall Brother Oscar Leo, an old Navy Chief Petty Officer, who for many years took such great pride as Marshal in conducting this ceremony in his picturesque and efficient manner. Many of the Brethren recognizing that Major General Henry Knox Lodge, at the completion of its first twenty-five years, had developed into a mature and special-type Lodge, felt that it had reached the stage when, in addition to the usual Blue Lodge ritual and procedures, it should embrace other distinctive practices and relationships. These would eventually become Lodge traditions, integral parts of Major General Henry Knox Lodge, and justify our existence not only as a regular Blue Lodge, but also as a military and patriotic body. For example, on 26 March 1952, Reverend and Right Worshipful Frank B. Crandall, a Charter Member, after translating the Loge de Table ritual from French into English, staged the first Table Lodge in Major General Henry Knox Lodge. 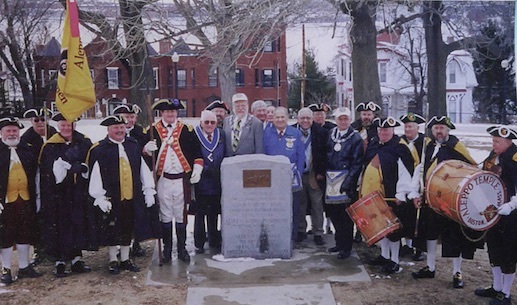 Thus, after a century and a half of dormancy, the ancient Masonic Feast, replete with both Military and Masonic origins and significance, was reintroduced not only into the Massachusetts Jurisdiction, but into American Masonry! This special event was a welcome change in fraternal fare, as it was the type of get-together that insured good fellowship and greater attendance. The "Ritual of the Seven Toasts" was always faithfully followed. For the next ten years or so, our beloved Chaplain Major Crandall, annually conducted our Table Lodge, and when his health no longer permitted it, he was succeeded in this assignment by Worshipful Meyer Weker. All were pleasant, meaningful and dignified occasions, and the use of wine, (or the optional grape juice) never resulted in any breach of discipline. Often, a speaker delivered a pertinent message, and our 30-year Life Membership Certificates were awarded between the prescribed courses. E.g., at the 10th consecutive Table Lodge on 24 March 1961, a salutary address, marking the centennial of the Civil War, was delivered by our Founder Colonel Frederic Gilbert Bauer, an authority on that fratricidal conflict. A number of past and presiding Grand Masters of this and other Jurisdictions, as well as other Masonic dignitaries, have attended at different times, but perhaps the most unique one in the series took place in 1973 when the presiding Grand Masters of Maine (Most Worshipful Charles T. Glassmire), Rhode Island (Most Worshipful George E. Kettleband), China or Taiwan (Most Worshipful Theodore L. Way), and Massachusetts (Most Worshipful Donald W. Vose), as well as Right Worshipful Stewart M. L. Pollard, National Secretary-Treasurer of the National Sojourners, and other distinguished Masons were present. Eventually, our By-Laws were amended to make it mandatory that the Table Lodge take place each year, and the occasion (usually the fourth Wednesday in April) was designated the "Frank B. Crandall Night". The idea spread and many other Blue Lodges followed our example, so that finally Grand Lodge adopted the popular Table Lodge concept, establishing official rules and a ritual based on Brother Crandall's. We are looking forward to our 25th Annual Table Lodge on 28 April 1976 as one of the significant features of the Lodge's 50th Anniversary. As a result of particular interest and satisfaction developed from the fact that some of the Brethren of Orient Lodge No. 15 of Thomaston, Maine, in particular Worshipful Raymond Robinson, traveled to Boston annually for this event, and were so impressed with it that they promoted it in their own State; in fact, they induced two of their Grand Masters, Most Worshipful M. Donald Gardner and Most Worshipful Charles T. Glassmire, to come to Boston to observe our performance. It is a pleasure for us to report that this finally led to the acceptance of Table Lodge by the Grand Lodge of Maine at their annual meeting in April, 1975. The only other Lodge in New England with a military requirement for membership (applicant must be a veteran) is Overseas Lodge No. 40 of Rhode Island. Colonel Bauer has noted the "helping hand" they extended to us in our formative days. This fine fraternal relationship existed rather passively for a number of years, but happily, it was actively resumed in 1961. Since then, we have witnessed their Rhode Island ritual in Boston, as for example on 28 February 1968, when a delegation of fifty strong, led by their Master, Worshipful David Kopech, and accompanied by their Grand Master, exemplified the First Degree; and they have seen ours in Cranston, as on 9 June 1964 when we raised our Brother Vincent T. Estabrook there. It is truly a warm and valuable connection, for the two Lodges and their individual members. In 1975, two of their Past Masters, David Kopech and Alexander M. Moffat, affiliated as members of Major General Henry Knox Lodge. We have a great deal in common, and should continue our close relationship into the indefinite future. We are grateful that our Lodge bears the illustrious name of Henry Knox, one of the great Americans of all time, a hero of the American Revolution and a founder of our Nation. He was undoubtedly the greatest soldier produced by the Commonwealth of Massachusetts, although largely unsung until lately. Born in Boston on 25 July 1750. he attended Boston Latin School, the first public school in the land, became an apprentice to a bookseller, and at 21 was himself a bookstore proprietor. As such he read everything available on many deep and learned subjects, especially the art of warfare. He was the father of American Army Artillery, and early and strongly espoused the concepts of a regular academy for the training of officers (West Point), and an organized civilian militia (National Guard), He was responsible for the establishment of the Springfield (Massachusetts) Arsenal, home of the Springfield rifle. Knox served as Secretary of War (including Navy), both under the Articles of Confederation and in President Washington's Cabinet. He formed the Society of the Cincinnati, of which he became the first Secretary, while his dear friend, Brother George Washington, was the first President. He died at his impressive home Montpelier in Thomaston, Maine, then a district of Massachusetts, on 25 October 1806. The suggestion was made that it would be fitting and proper for the Lodge to hold a yearly observance in respect to his memory, to help keep alive his name and deeds in the hearts and minds of all. P'our of our devoted members, Right Worshipfuls Roger A. Vint, and Thomas Knudson, Worshipful Meyer Weker, and Reverend Brother H. Blair Whitney, journeyed to quaint, old Thomaston, 75 miles northeast of Portland, on the attractive rock-bound coast of Maine on July 25, 1963, where at the Old Town Cemetery in which General Henry Knox is buried, they joined with other military and patriotic groups to celebrate his birthday. In the afternoon there were speaking exercises at Montpelier, in which they likewise took part. We soon became a sustaining member of the Knox Memorial Association of Thomaston, Maine, and cooperated closely with their dedicated President, Brother John Ruggles Egerton (later one of our Honorary Members). Every summer since, a delegation, sometimes accompanied by their ladies, have enjoyed this pleasant trip and experience, while honoring Knox. This naturally led us to the Masonic Lodge in Thomaston, Orient Lodge No. 15 (chartered in 1805 by the Grand Lodge of Massachusetts) and our two Lodges quickly developed a cordial friendship. On each visit, our members are greeted by a group of theirs, and several times, Orient Lodge has been our host at their Masonic Temple, for a public dinner and meeting. In turn, we have had the pleasure of greeting a number of them at various times in our Lodge in Boston. Worshipful Raymond Robinson became an affiliated member of our Lodge. The highlight of these Maine events occurred on our tenth consecutive pilgrimage in 1972, when Orient and Major General Henry Knox Lodges conducted a joint dinner and a public meeting, which were graced by Most Worshipful Charles T. Glassmire, Grand Master of Maine, and Most Worshipful Donald W. Vose, Grand Master of Massachusetts. At this time, the Knox Award for Patriotism was presented to our Lodge by the Knox Memorial Association, the first time an organization rather than an individual was so honored! Major General Henry Knox Lodge originated from a degree team of New England Chapter No. 12 of the National Sojourners, and the two organizations were in touch with each other through the years. More recently, even closer contact between them developed when Brother Baruch Margolin became Secretary of the Chapter, then succeeded by Right Worshipful Alvin M. Steinberg, and Brother Kermit C. Archer became Massachusetts Regional Representative of the National Sojourners, later succeeded by Worshipful Meyer Weker, all of whom were also members of the Lodge. In recent years there have been several highly successful joint meetings in the Lodge room, when New England Chapter's Third Degree Team "raised" a military candidate for the Lodge, and the Chapter was then permitted to take over and initiate him into the Sojourners. More such programs are expected in the future, to the advantage of both groups! Due to the favorable conditions for both Masonry and the Armed Forces, particularly during and following World War II, 324 signed the By-Laws during our second 25 years. And so, our membership grew steadily, reaching its highest mark of 514 in 1962. However, later in the 1960's and 1970's, conditions changed unfavorably so that the figure stands at 440, as of the end of our last fiscal year, 31 August 1975. Although we had members who served in the Vietnam War, the increasing opposition and unpopularity of this venture, and with it, to all things military, proved harmful indeed to our Lodge. Another adverse factor was the disenchantment of youth with the so-called "establishment", of which Masonry was considered a part. All this was intensified by the fact that we were an intown Lodge, and the shift of populations, economic dislocations, and sharply rising crime rates, to say nothing of the perennially difficult traffic and parking conditions, all worked to the detriment of all life and activity in the big city. For Major General Henry Knox Lodge, all these conditions meant that interest declined, candidates became more infrequent, and attendance dropped. At the same time, the average age of the membership rose higher and higher and the outlook for the future seemingly became less encouraging. But, we still trust that what we have been experiencing is merely one of these temporarily unfavorable periods that Masonry has gone through and survived in the past, and that we shall soon enter a new era of fraternal growth and prosperity! One step towards alleviating the situation in Major General Henry Knox Lodge was taken during the recent administration of Worshipful Max H. Summerfield, when our By-Laws were amended to allow the degrees to be conferred on all veterans (hitherto it was limited to men on active duty or in the active reserve). It might be mentioned that Worshipful Summerfield had served in the Fast in 1932, and then returned for a second term forty years later — in 1972. On 24 September 1975, our beloved Brother Summerfield presented a large handsome looking hour glass to the Lodge. Fifty years ago, he and his brother Worshipful Melvin B. Summerfield, gave us the Holy Bible, Square and Compasses, which are still in constant use on our altar. The financial situation of the Lodge has always been excellent, in all respects, thanks to the foresightedness of the framers of the By-Laws, and the economical administration practiced by our Masters. All but twenty dollars of each initiation fee of $60.00 and every affiliation fee, are deposited into the Permanent Fund. We are indeed fortunate that as a military and not a social-type Lodge, we are not confronted by the heavy expenses of many other Lodges. The Permanent Fund income takes care of more than half of our costs of operation. To complete the picture, the fee for the degrees, exclusive of Grand Lodge's $11.00 charge, remains as always, only $60.00 while the affiliation fee was raised several years ago from $10.00 to $25.00. As a military Lodge, we often do affiliate Masons who are veterans, which helps offset the lack of candidates for the degrees. Our resident dues (applicable to the six eastern counties of Massachusetts) which have not changed in 45 years, are only $8.00 and non-resident dues are a mere $3.00, while each one additionally pay Grand Lodge dues of $5.00. In the non-resident category, we have some 200 members, and as has been noted, the Lodge receives only $3.00 for itself, while it collects for Grand Lodge the larger sum of $5.00. The amount paid to us by our distant Brethren does not cover their printing and mailing costs, but the Lodge is loathe to increase their dues, as it is desirous of retaining these ex-servicemen who became Masons in our Lodge while on active duty in the Boston area, and after returning to their homes, located throughout most of the States of the Union and several foreign places, have continued as members. Our By-Laws were amended as regards automatic life membership, so that today one has to attain age sixty as well as have thirty years of good dues paying membership. The same status may be purchased at any time for an amount equal to twenty times the annual Lodge dues. In 1970, thanks to the generous gift of Nettie Archer, the widow of one of our Brothers, our first memorial philanthropic fund was created. Each year, the income of the "Colonel Kermit C. Archer Memorial Fund" is applied to a worthy cause or purpose, e.g., one year it was used to purchase membership for the Lodge in the USS Constitution Museum Foundation, and another year, a donation was made to DeMolay to provide a training scholarship for a boy, etc. It is intended to do some good every year, rather than remain dormant. We are indebted to the devotion and generosity of the late Brother Joseph Halpern and the late Florence K. Payne, widow of Charter Member James Payne, for the first legacies left to Major General Henry Knox Lodge. The income from the latter will make it possible for a lobster and strawberry festival, free to all members, every June, while we hold a memorial service for James and Florence Payne. The Master in 1961, Worshipful Alvin M. Steinberg, devised a distinctive lapel pin for the Lodge, consisting of a small square and compasses set in a blue plastic rosette, and one is presented to each new member. A revised Code of By-Laws, proposed by a committee, consisting of Right Worshipful Roger A. Vint and Worshipful Samuel Shedlow and Worshipful Meyer Weker, was duly adopted by the Lodge and approved by Grand Lodge in 1967. These were essentially the old rules brought up to date, with several additional provisions. It was printed and a copy placed in the hands of every member. On 22 April 1953, Brother Robert Edwin MacLeod was raised to the sublime degree of Master Mason by a full team of fifteen MacLeods from about ten Lodges in Greater Boston, with our own Worsnipful Henry M. MacLeod as Master. Right Worshipful and Major General Chauncey Dean Merrill, on his election as Junior Grand Warden, became the first member of Major General Henry Knox Lodge to achieve the status of Permanent Member of Grand Lodge. On 22 January 1954, the Grand Master, Most Worshipful Whitfield W. Johnson, presented him with a Henry Price Medal, an act roundly applauded by all the Brethren present. This is the Grand Lodge's highest award and is bestowed only on the most important dignitaries in Freemasonry, and those who have made the greatest possible contributions to the Fraternity. The 32nd Anniversary of Institution was observed on board "Old Ironsides" on 17 March 1958, during the administration of Worshipful Arnold Glasser. Right Worshipful Colonel Paul L. Perkins, the Deputy Grand Master, was the inspiring speaker of the occasion. A meeting of great interest to all revolved around the late, highly regarded Right Worshipful Roger A. Vint, who had been employed for almost 35 years as Secretary to the Grand Master, and was then about to retire. He was installed as Master of our Lodge on 22 September 1961 by the presiding Grand Master, Most Worshipful Laurence E. Eaton, who extolled Brother Vint as the worthy and capable right hand of many Grand Masters and presented him with the Henry Price Medal. In 1968, the national colors and the Major General Henry Knox Lodge flag which we had used regularly for more than 40 years and which were pretty well worn, were retired. Thanks to the voluntary contributions of a large number of the Brethren, they were replaced by new and attractive banners, which were formally presented to the Lodge at a largely attended meeting on 27 March 1968 by our Past Master, Right Worshipful and Major General Chauncey Dean Merrill. At this time, the Presiding Master, Worshipful Meyer Weker, awarded certificates of Honorary Membership to all the remaining living Charter Members. The Grand Master was represented by Right Worshipful Crockett Brown, the Deputy Grand Master and a native of Thomaston, Maine (General Knox's home) who made some pertinent remarks. In keeping with our aim to be of service to the military, we recall that at the request of Grand Lodge, we conducted Masonic funeral services for out-of-state Masons on several occasions: e.g., on 30 January 1958, over the remains of Brother Magnus Olaf Bengston, a member of Hadrian Lodge No. 1970 of Shields, Northumberlandshire, England attached to a British merchant ship in Boston, Harbor; on 16 April 1968 for the late Brother Erven Albert Orr, a former soldier, of Argo-Summit Lodge No. 1133 of Argo, Illinois. For more than a quarter of a century, the Lodge has been fortunate in the musical harmony provided by Worshipful Robert Louis Gerling, formerly a concert tenor of standing, as soloist, and Brother Willem Friso Frank, one of the foremost musicians in this part of the country, as organist. Their high stature undoubtedly played a large part in inducing Worshipful Frederic Gilbert Bauer to give to our Lodge his private collection of the Masonic Music of our immortal Brother Wolfgang Amadeus Mozart, and some years later, on 25 May 1966 (as well as on other occasions) this was the basis of a fine program of fraternal music to which we were treated by Brothers Gerling and Frank, and other artists. As a military Lodge, about the only time when our calendar permitted the Brethren to have their ladies and other non-Masons accompany them was the Public Installation of Officers in September. Recognizing that some sort of distinctly social evening would please the membership and thereby strengthen the Lodge, we held our first "Family Night" in the spring of 1968. As might be considered proper, the locale was an officers' club in one of the defense installations. In accordance with Lodge policy, it was oh a "pay as you go" basis, so that there was no cost to the Lodge. A number of these have been held, and we trust that these pleasant events will continue! Of course, non-members have always been welcome to come to Thomaston, Maine in July and participate with us in the Henry Knox Birthday Celebration, which many have made part of their summer vacation plans. Room 905 in the Masonic Temple, commonly known as our "Lodge Quarters" is used to house the physical possessions and records of the Lodge, the Lodge officers' service uniforms worn at our meetings, as well as for committee and sodality sessions. In the center, there is a line-looking conference table surrounded by twelve captain's chairs, each bearing the seal of the Lodge and each donated by a Past Master or a Brother, in 1951-52. The walls are covered with significant pictures, trophies, etc., including impressive portraits of our namesake Major General Henry Knox, our founder and First Master, Colonel Frederic Gilbert Bauer, and Colonel Kermit C. Archer, in whose name the Memorial Fund was established. The Knox picture was unveiled on 26 June 1963 in the presence of the Grand Master, Most Worshipful A. Neill Osgood, the Grand Secretary, Right Worshipful Earl W. Taylor, the Grand Marshal (now Grand Secretary) Right Worshipful Robert P. Beach, and other leading Masons. Our Lodge Secretary, Worshipful Meyer Weker, offered some remarks on the life and work of Major General Henry Knox, which appear, with a copy of the Knox portrait in the Proceedings of the Grand Lodge of Massachusetts for 1963. Colonel Bauer's portrait was unveiled on 26 May 1965, with Right Worshipful Norman M. (jay, the Deputy Grand Master, in attendance. Our own Right Worshipful and General Chauncey D. Merrill, Past Junior Grand Warden, did the actual unveiling, and made appropriate comments, in both instances. The charter of Major General Henry Knox Lodge lists 102 charter members. Today, we can point to only four survivors: Bro. Ray Sherman Adams of Massachusetts Wor. Roland Everard Palls of Missouri Bro. Theodore Gibbs Holcombe of North Carolina Wor. Max Harold Summerfield of Massachusetts We wish each one of them many more years of good health and happiness! Several Brothers whose Masonic achievements during the last 25 years brought credit to our Lodge are deserving of mention: Right Worshipful Charles H. Sargent, Jr., Past Master, did an outstanding job as Grand Lodge Relief Commissioner, 1949-1965; is Grand Representative of the Grand Lodge of Valle de Mexico; has been President of the Masonic Relief Association of the United States and Canada; and is holder of the New Hampshire Jeremy L. Cross Medal for Distinguished Service. Right Worshipful Alden A. Osgood, three times our Master, was an effective District Deputy Grand Master of the Chelsea Third Masonic District. Right Worshipful Thomas Knudson, Past Master, versatile Masonic scholar, ritualist and worker, was District Deputy of our District. At the present time, another of our Past Masters, Right Worshipful Alvin M. Steinberg is serving with distinction as our District Deputy Grand Master. Worshipful Meyer Weker, filled the office of Secretary for 18 years, the longest period of such service in the Lodge's history, and has been designated Secretary Emeritus. He has served as President of the Masonic Secretaries of Massachusetts. In 1967, he was awarded the Joseph Warren Medal for Distinguished Service. Having been Master of three Lodges, he is now again presiding in the East during our 50th Anniversary Year. As we know, Major General Henry Knox Lodge was organized in 1926 for the purpose of serving both Masonry and the Military. For a half-century, it has adhered faithfully to this concept, yet it should be apparent from a reading of this history, that in recent years we have developed a new dimension, which might be described variously as "Preservation of our Heritage", "Americanism", "Patriotism", or a combination of these. This is hardly surprising, as both Masonry and the Military, by precept and example, seek to inculcate in each of its members, love of and devotion to country as an essential ingredient. And, too, the approach and current observance of the Nation's Bicentennial, has furnished a special impetus to this trend. In our case, these new ideas and endeavors are, naturally, dedicated largely to advancing the name and fame of the outstanding American who is our namesake, Major General Henry Knox. We are pleased that he has been established as the leading figure in the Massachusetts Bicentennial Observance, and has also received considerable attention throughout the land. in Boston by order of Secretary of War and Navy Henry Knox). The observance of Knox's departure from Washington's Headquarters, Longfellow House, Cambridge for New York on 16 November 1975 at which time Worshipful Master Meyer Weker delivered a tribute to Major General Henry Knox, and Portrayal of the reception of Henry Knox, under the auspices of the Grand Lodge of New York, at Federal Hall, New York City on 25 November 1975, on which occasion Right Worshipful Wyman S. Randall (as Knox) was accompanied to New York by Worshipful Meyer Weker, Master of our Lodge. As a significant part of its 50th Anniversary Observance, Major General Henry Knox Lodge, on the evening of 17 March 1976, held a Special Communication on the Gun Deck of "Old Ironsides", the exact time and place of our founding a half century earlier. This commemorative event was attended, among many others, by Commander Tyrone Martin, Commanding Officer of the beloved vessel, Admiral Roy D. Snyder, Commandant of the First Naval District, whose flagship she is, and Most Worshipful Stanley Fielding Maxwell, Grand Master of Masons in Massachsuetts. At this time, a Paul Revere Bowl, suitably inscribed, was presented to the "Old Ironsides" Museum. And tonight, 24 March 1976, the Grand Master, Officers and Past Grand Masters of our Grand Lodge, Lodge officers (in military uniform), members and guests, and all their ladies, have assembled for dinner in the Paul Revere Room, and for the Official Golden Anniversary Celebration in Corinthian Hall, at the Masonic Temple, 186 Tremont Street in the City of Boston and Commonwealth of Massachusetts. As we conclude this brief sketch of the growth and development of our beloved Lodge, our prayer is that we and our successors will continue, as future years unfold, to live up to our motto. Deo et Patriae, "For God and Country", in the finest tradition of Major General Henry Knox Lodge. It is indeed with a justifiable sense of pride that Massachusetts' only military Masonic Lodge celebrates its seventy-fifth anniversary early in the millennium. During these past twenty-five years of the Lodge's existence, the world has seen conflicts which affected the lives of so many. Since the Lodge's inception by veterans of World War I, our Brethren have served honorably in World War II, the Korean Conflict, the Vietnam War, and peacekeeping efforts throughout the world. We can only reiterate our motto: "Deo Et Patriae" - "For God and Country". The preceding "Second Twenty-Five Years of Major General Henry Knox Lodge" included the background of our Charter Master and author of the "First Twenty-Five Years", Wor. Frederic Gilbert Bauer. The author of the "Second Twenty-Five Years", R. W. Meyer Weker, was a leading light in the Lodge for many years. He was a graduate of Boston University, a Lieutenant Colonel of the Army Judge Advocate Corps, an attorney for the Veterans Administration, a Past Grand Master of the Grand Council of Royal and Select Masters, a Grand Representative, and truly an authority on Masonry. It was through R.W. Meyer Weker's efforts that our By-Laws were amended, making it mandatory that a Table Lodge be held every year. It was also through his efforts that the fraternal relationship was established with Orient Lodge of Thomaston, Maine, and that this Lodge became a sustaining member of the Knox Memorial Association, also in Thomaston. R. W. Brother Weker also established, with Mrs. Nettie Archer, the charitable fund named for her late husband, and our Brother, Kermit C. Archer. R.W. Brother Weker certainly deserved the many Masonic honors bestowed on him, and he served this Lodge with distinction and with honor. It is interesting to note that R.W. 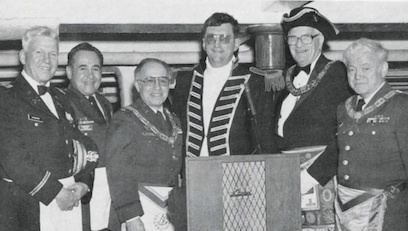 Brother Weker was the chairman of the 60th Anniversary meeting held aboard "Old Ironsides" on March 17, 1986. However, after he had made all the plans for the event, he was stricken ill and passed away just prior to the meeting. R.W. Brother Alvin Morris Steinberg was then appointed Chairman of the event and continued carrying out R.W. Brother Weker's plans. In attendance at that meeting were the Grand Master, M.W. 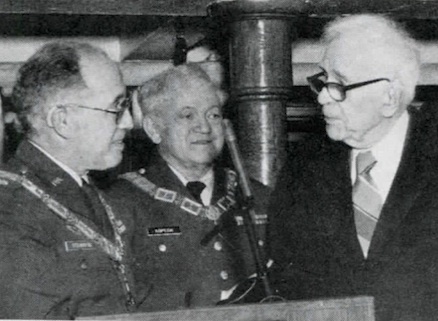 David B. Richardson; Past Grand Master, M. W. J. Philip Berquist; Brigadier General Ronald Markarian, the National President-elect of the National Sojourners; Cdr. Gilbert Brown, the Commander of the Constitution; together with Brethren from many lodges who practically filled the gun deck of "Old Ironsides". It was, indeed, a memorable and most auspicious event. Also, in this last quarter-century, the Lodge was honored to have R.W. John Martin Kandres, who served twice as Master, appointed District Deputy Grand Master of the Chelsea Third Masonic District. His was an exemplary term of office and reflected honor to both the Lodge and the District. R.W. Donald Francis Tabbut, who also served two terms as Master, was also appointed District Deputy Grand Master, serving as the Deputy for the Chelsea Third Masonic District during this our 75th Anniversary year. They both reflect the best in Masonry - true fraternalism! Veterans Medals were also mailed or otherwise presented to all 50-year Brethren as they became eligible. R. W. Vincent Taft Estabrook who, as Chairman of the Trustees for many years, insured the integrity and well-being of our trust funds. Wor. David Paul Kopech and Wor. David Albert D'Agostino, both of whom affiliated with this Lodge after serving as Masters of Overseas Lodge of Cranston, the Military Lodge of Rhode Island, thus continuing the close relationship which has existed between our two Lodges these many years. Wor. Kopech also served as Grand Master of the Grand Council of Royal and Select Masters of Rhode Island. Wor. Clifford Franklin Howe passed away during his term of office. His term as Master was completed by Wor. Frank Chandler Merrill, the Senior Warden. In appreciation for all of the special efforts and considerations contributed by Wor. Merrill, the Lodge elected him Honorary Past Master and presented him with a Past Master's jewel. This was a first for the Lodge. R. W. Alden Arthur Osgood, who served as Master in 1954, returned to the Oriental Chair in 1974 and again in 1988. R. W. John Martin Kandres, who served as Master in 1980, was again elected Master in 1990, and currently serves the Lodge as Secretary, doing his usual outstanding work. Wor. David Albert D'Agostino, mentioned above as a Past Master of Overseas Lodge, is currently the Secretary of that Lodge, as well as being a member of our Board of Trustees. R. W. Donald Francis Tabbut, our Lodge's right hand, and the only Pearl Harbor survivor in the Lodge, continues to serve the Lodge in all capacities, truly exemplifying all the tenets of our Order. As always, the high points of each year have been public gatherings, such as the "Family Night", Installation of Officers, and the Payne Dinner, where our families and friends could join us in the festivities. In addition, our annual pilgrimage to Montpelier, the home of General Knox, including the wreath-laying ceremony at his grave, has attracted many of our Brethren, who make a weekend celebration of the event in conjunction with the brethren of Orient Lodge of Thomaston. Our R. W. John Martin Kandres and their Wor. Raymond Robinson have cooperated and coordinated the weekends in an outstanding manner these many years. As a result of the warm relationship which exists between the two lodges, we were honored to have three Past Grand Masters of Maine, M.W. John Efstrathois Anagnostis, M. W. Robert Vernley Damon, and M. W. Wayne Thomas Adams, join us, as well as our own Past Grand Master, M. W. David Borden Richardson, all unanimously elected affiliate members. The Lodge was further honored on July 25, 1985, when the "First Day of Issue Ceremony" was held at the High School in Thomaston. 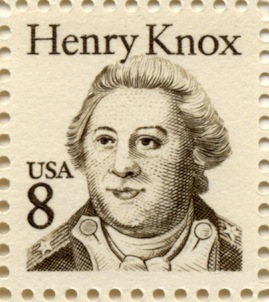 This ceremony marked the issuance of an 8-cent U.S. postage stamp featuring Henry Knox. Among the honored guests on the podium was our presiding Master, R. W. Franklin Newell Cunningham. Many of our brethren were also in attendance. Among the First Day Covers presented that day was one honoring Major General Henry Knox Lodge, the only military lodge in Massachusetts. In 1999, upon the occasion of his being presented with his 50-year Veteran's Medal, R. W. Alvin M. Steinberg presented the Lodge with a framed enlargement of the stamp, which now hangs in Room 905 of the Masonic Temple in Boston. We are entering the millennium in financially good health, attributable to a sound investment strategy originated by R. W. Vincent Taft Estabrook and continued in recent years by our Treasurer, R. W. Clark Baldwin Loth, who affiliated with our Lodge after serving as District Deputy Grand Master of the Boston First Masonic District. Our current financial status enables us to continue to make charitable contributions to Masonic charities and other worthy programs, thus fulfilling our fraternal and moral obligations. The Table Lodge, which first originated in Major General Henry Knox Lodge, and held each April, continues to attract a large number of Brethren, with attendance between 80 and 100. Since it is held with strict adherence to the ritual, as laid out by the late Wor. Frank Byron Crandall, who translated the ritual from the French "Loge de Table", we are honored to have as our guests at each Table Lodge members of the Grand Lodge, with the presiding Grand Master attending at least once in his three-year term. This 75th Anniversary year we also celebrate the 50th Anniversary of our first Table Lodge, and our guest of honor will be our presiding Grand Master, Most Worshipful Fred Kirby Bauer. Despite various "Police Actions" and "Peacekeeping Efforts", and the subsequent decline in personnel in the Armed Forces, we saw a decline of membership in our Lodge, from 440 in 1976 to 227 in 1999, and additional losses due to deaths and demits in the year 2000. With the realization that taking in candidates for the degrees was extremely difficult, in that these candidates could be only men on Active Duty, in the Reserves, or Veterans, an effort was made in early 2000 to bolster membership by Affiliates, members of other lodges who could meet our Lodge's criteria. This was accomplished by a letter sent by our Secretary to the Secretaries of all the constituent Lodges in Massachusetts, which letter and procedure was approved by our Grand Master. This letter, literally a "Call to Arms", offered a waiver of the affiliation fee until September, 2000. The results were most heartening. More than 70 Master Masons of Massachusetts' Lodges answered our call to affiliate, boosting our membership, in this, our 75th Anniversary Year, to 273. We hope that our programs will continue to attract new affiliates and that Major General Henry Knox Lodge will continue to set new standards and add to the meanings of "Fratemalism" and the "Military-Masonic Bond", ever remembering that our heritage as Americans and as Freemasons is a Sacred Trust. The gun deck of the United States frigate Constitution, "Old Ironsides" in the past the theatre for many stirring events was the scene Wednesday afternoon, March 17, at sundown of an impressive ceremony, when the first military lodge of Masons ever to be instituted in this state, and the fourth in the United States, was formally brought into existence by Right Worshipful Frederick W. Hamilton, Grand Secretary of the Grand Lodge of Massachusetts. The other military Masonic lodges are located at Fort Leavenworth, Fort Munroe and Providence, R. I., the latter made up for the most part of officers and men who served overseas during the world war. Herbert S. Locke of Medford, District Deputy Grand Master, was unable to be present owing to illness, and Byron S. Jackson, District Deputy Grand Marshal, assisted the Grand Secretary in the rites of institution. The officers selected to officiate while the new lodge is under dispensation the following: Master, Col. Fred G. Bauer, J. A. G. D.; Senior Warden, Col. George D. Moore, I. G. D.; Junior Warden, Col. W. E. Horton, Q. M. C., Treasurer, Lt. Col. Frank B. Lawler; Secretary., Maj. Walter B. Phelps, Inf. Chaplain, Capt. Frank B. Crandall, C. C.; Assistant Chaplain, Capt. Percy T. Edrop, C. C.; Marshal, Brig.-Gen. Malvern Hill Barnum; Senior Deacon, Lt. Melville F. Cate, U. S. N.; Junior Deacon, Charles T. Harding, Q. M. C.; Senior Steward, Lt. John A. Price, U. S. N.; Junior steward, Sgt. Harold J. Arnold, U. S. A.; Inside Sentinel, Col. Walter C. Sweeney; Tyler, Staff Sgt. Ralph A. Snyder, U. S. A. At the conclusion of the ceremonial an adjournment was taken to the armory where Col. Bauer presided and a number of felicitous addresses followed. Among the speakers were Dr. Hamilton, Rt. Wor. Guy H. Holliday, Past District Deputy Grand Master Maj.-Gen. Mark L. Hersey, U. S. A. retired, and others. The chairman introduced Loring Cushman Child, fourth great-grandson of Col. George Claghorn, master builder of the Constitution, and he was accorded a rousing reception. Following the speeches, collation was served. For the present at least the lodge will hold its communications at the army base in Roston. On the evening of June 26, 1963, the members and guests of Major General Henry Knox Lodge, which had already been opened for its Regular Communication, proceeded to the Adams Room in the nearby Hotel Touraine, where a fine dinner was enjoyed in a pleasant atmosphere. Upon reconvening in Tuscan Hall at 7:45 P.M., Most Worshipful A. Neill Osgood, Grand Master of Masons in Massachusetts, was formally received. He was accompanied by the Grand Secretary, Rt. Wor. Earl W. Taylor, and by two of his District Deputies, Rt. Wor. Alden A. Osgood and Rt. Wor. Edgar M. Mills, of the Chelsea Third and Boston Third Masonic Districts, respectively, as well as by his Grand Marshal, Rt. Wor. Robert P. Beach. The Grand Master assumed the East and momentarily presided over the Lodge. Several of the Charter Members and a number of the Past Masters were among those in attendance. It might be noted that each of the lodge officers and participants in the program was attired in his particular service uniform, as might be expected in the only military lodge in this jurisdiction. The occasion was the unveiling of a large and colorful portrait of Major General Henry Knox, the distinguished patriot-soldier and Mason, for whom this Lodge was named. Rt. Wor. Thomas Knudson, presiding Master, explained that the idea of the portrait originated with our Charter Master, Wor. Frederic Gilbert Bauer, who had selected a picture now hanging in the Pentagon at Washington as a model. Unfortunately, his very serious illness prevented him from being with us, and Rt. Wor. Chauncey D. Merrill, a Past Master of the Lodge and Past Junior Grand Warden, would be in charge of the program. Bro. Morris A. Zirlin, Senior Warden-elect of Ocean Lodge, was introduced as the artist, and was accorded a great round of applause. An inspiring prayer of dedication of the picture was delivered by Bro. Dr. Thomas E. West of the First Baptist Church in Winthrop. Wor. Meyer Weker, Secretary of the Lodge, presented a brief outline of the life of Henry Knox, which is appended hereto. Then followed messages of greeting from Charter Members and Past Masters who, because of time, distance, and circumstances, were unable to come to Boston and participate in the evening's ceremonies. R. W. Bro. Merrill pointed out that it was only proper that a good likeness of Brother Knox should be in view in Room 90S, the Lodge's Quarters, as an inspiration to all. Surrounded by Charter Members and Past Masters of Major General Henry Knox Lodge, he formally unveiled the large and striking oil portrait, attractively framed. Expressions of admiration were heard on all sides. The Grand Master expressed his keen pleasure at the opportunity to be present on such an auspicious occasion, despite the excessive heat of the day. He congratulated the artist on his excellent production, remarking that it would constitute a worthy and welcome addition to the many fine paintings that graced the walls of the Masonic Temple. He complimented all who arranged and took part in this event of both historic and Masonic significance. Exercising the prerogatives of his office, Most Worshipful Brother Osgood closed Major General Henry Knox Lodge in Ample Form at 8:50 P.M.
Grand Master David B. Richardson joined in the festivities of the 60th anniversary of Major General Henry Knox Lodge on March 17. The Lodge was instituted on the gun deck of the U. S. S. Constitution in 1926 on Evacuation Day. A dinner at the Front Page Restaurant. Charlestown, preceded the events that included opening of Grand Lodge and the host Lodge in the Isaac Hull Room at the Charlestown Navy Yard. Cdr. Joseph Z. Brown, 61st Commandant of the ship, welcomed the Lodge and the guests. In addition to greetings by the Grand Master, other speakers included Wor. William Sweet, Master of Overseas Lodge No. 40 of Cranston, RI; Robert C. Davenport, President of New England Chapter No. 12, National Sojourners; Ronald Markarian, President-elect of National Sojourners, and R. W. John D. Manning, D. D. G. M. of the Chelsea 3rd District. Wor. David P. Kopech, Master of the Lodge, presented R. W. Alvin M. Steinberg who was Master of Ceremonies. R. W. Meyer Weker, Lodge Secretary, had been Chairman for the occasion but he died suddenly in February. Massachusetts' only military Lodge, Major General Henry Knox Lodge, along with the Aleppo Temple Minutemen were in South Boston in March for the dedication of General Knox square on the 15th, and two days later for Evacuation Day ceremonies on Dorchester Heights. For the past few years the Lodge has joined the South Boston Citizens' Association in the March 17th observance. This relationship has been very good for Masonic awareness. Major General Henry Knox Lodge was constituted on the gun deck of the USS Constitution on March 17, 1926. The lodge returned to Old Ironsides in October to confer the Third Degree on Bro. Dan R. Foster, a seaman on special detail with the USS Constitution. Bro. Foster's interest in Masonry began with his grandfather, Bro. George A. Foster. Jr.. who is a Kansas Mason. Seaman Foster took his first degree when living in Stephensville, Texas, before being assigned to Boston on the oldest active naval vessel in service to our country, first sailing in 1798. Pursuing his interest in Freemasonry, Bro. Foster met members of Major General Henry Knox Lodge, named after the Revolutionary War General who transported cannons to Boston from Fort Ticonderoga in New York to target the British ships in Boston Harbor. While serving as Secretary of War under President Washington, General Knox commissioned the building of the USS Constitution. The spikes and copper sheathing used on the USS Constitution were provided by Paul Revere, a Past Grand Master of our Grand Lodge. Bro. Foster is pictured with Wor. Bruce Newman, presiding officer of Major General Henry Knox Lodge on the berthing deck of the USS Constitution. The deck, two levels below the main deck, has "sleeping hammocks." and very low ceilings compared to today's vessels. This page was last modified on 22 March 2019, at 13:07.